If you’re worried about driving your car during the winter months, then the new Toyota Winter Check offer is just for you. 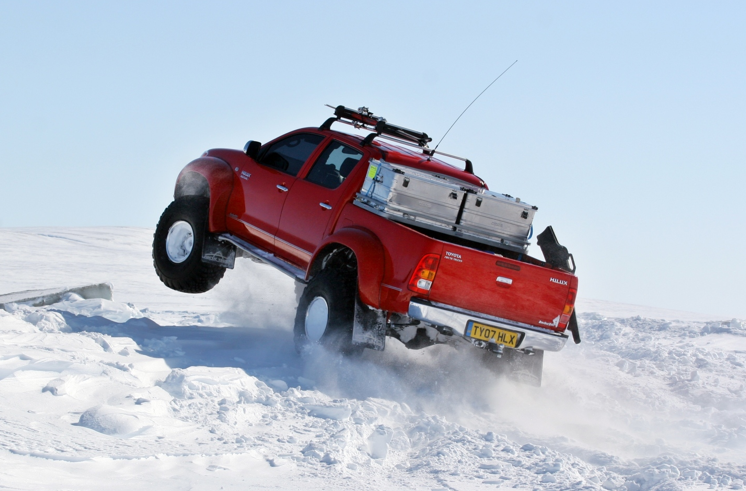 We can’t promise that your Toyota will be turned into the all-conquering Polar Hilux (pictured), but Toyota’s trained technicians will thoroughly inspect your vehicle to make sure it’s prepared for the cold weather. And, if you’re quick, you’ll receive a free car care kit worth £35! The Toyota Winter Check is available for £19.95 at your local Toyota Centre. The check includes a vehicle safety report, tyre check, oil and screenwash top-up, visual brake check, lights check and a wiper check. To take advantage of the complimentary car care kit offer, you’ll need to use a special voucher and have the Winter Check carried out by 31 December 2010 (see update below). Click here to download the Winter Check voucher from the official Toyota UK Facebook page. This offer is available to all Toyota owners in the UK, so don’t forget to share the news with your friends and family this winter. Update 21/12/10: With wintry conditions set to continue across the UK over the festive period, it’s only fitting that Toyota has extended its car care kit Winter Check special offer. Book your Toyota in for a Winter Check before 28 February 2011 and you can claim your free Toyota car care kit – click here to download the voucher now. I short this short video using a qualified mechanic to help people out this winter.